Now I have to do this post or else Decadent Dave, THX-1138 and Mola Ram will have nothing to write about. Far be it from me to leave them bored. 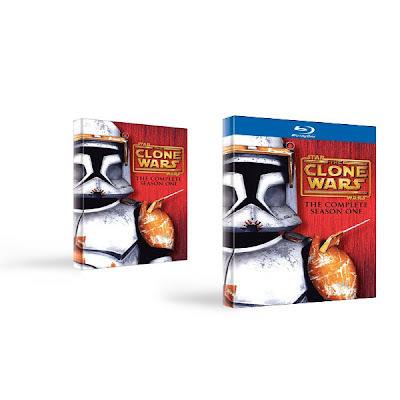 Lucasfilm will release on November 3rd, the first season (volume 2) of the Star Wars "Clone Wars" that Cartoon Network airs. This time, you can give George Lucas coinage for a DVD or Blu-Ray of the series. If you read the blog you know I've been very, very sceptical of this series. I hated the Clone Wars movie that was released and expected the series to be just as bad. I was pleasantly surprised and found the series was quite fun by the season end. My biggest complaint of course, is the Hannah Montana Padawan that tags along with young Darth Vader-to-be. Otherwise, it's fun and I look forward to the next season. Looks like you beat them to the punch, Honor. If you hadn't of said something they would be on hear ranting about Lucas this, Lucas that. Raped my childhood, blah, blah, blah.